In Search of Luca : Halloween - Italian traditions. October 31st. That means it is Halloween (or Hallowe'en). The name is derived from "All Hallows' Eve", the eve or vigil before the Western Christian feast of All Hallows (or All Saints), which is observed on November 1. Halloween, as we know it today, has slowly evolved from the United States of America and has been adopted in Europe, especially Italy. Italians still carve pumpkins, children still dress up in costumes (“Dolcetto o scherzetto?” (Trick or treat?) and, in some cities, you will find Halloween tours of medieval towers, castles and other 'spooky' sites. But tradition goes a long way in Italy, and many people still prefer to think of the next few days for different reasons. Halloween falls just before two important religious holidays in Italy at the beginning of November. The first day of the month (November 1) is Ognissanti or Tutti i Santi (All Saints’ Day) and is a day dedicated to honouring all the saints and martyrs who have died for the Catholic faith. Ognissanti is a national holiday in Italy, and most businesses close for the day. In the Roman Catholic Church, All Saints' Day is a Holy Day of Obligation in many countries, meaning going to Mass on this day is required. Traditionally Italians, across the country, attend Mass and celebrate the day together with family. Then, on the following day (November 2), is the celebration of All Soul’s Day (“Il Giorno dei Morti”). The commemoration of all the faithful departed is celebrated by the Church on November 2, or, if this falls on a Sunday or a solemnity, the feast is celebrated on November 3. 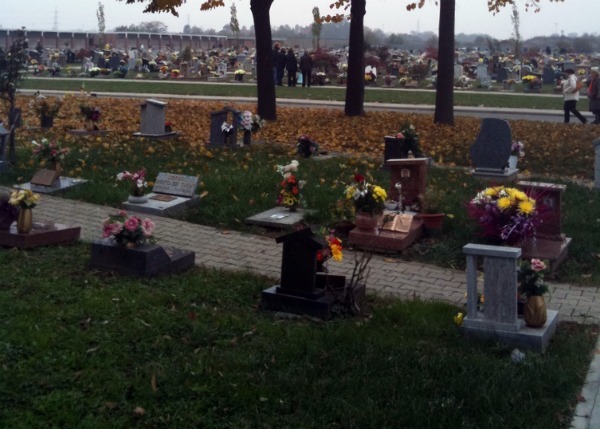 On All Souls’ Day Italians visit the cemeteries and bring flowers for their departed loved ones. Chrysanthemums flowers are traditionally laid at the gravesides, as this symbolises death in Italian culture. All Saints’ Day and All Souls’ Day are celebrated with the family and Italians make a point of getting together for a special family lunch where they celebrate the feast and eat traditional ,and regional, food. For example, in Romagna, a region famous for its cuisine, the “piada dei morti”, a round flatbread filled with nuts, almonds, raisins and red wine from Romagna, Sangiovese, is prepared. Another sweet prepared during this time is the “fava dei morti”, a little biscuit made of almonds. The Fave dei Morti recipe goes back to pre-Christian time when fava beans were used as a ritual offering to the dead and the gods. 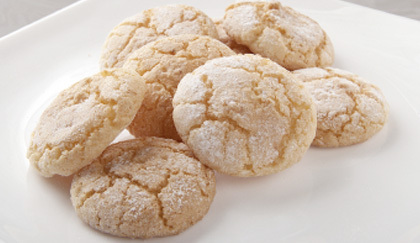 These cookies are shaped like fava beans and are baked in the Marche region. Sicilians traditionally eat “pupi ‘i zuccuru”, a sweet bread shaped like little dolls. In Lombardia, the locals will eat Pan Dei Morti (or Bread of the Dead), these are cookies made to remind everyone of dead men’s bones. In Trentino, bells ring to call the dead and the table is left set with the fireplace lit for the whole night and in Abruzzo lamps are left lit and the table is left set while children go to bed with a bag of broad beans and sweets to symbolise the link between the past and present generations. Together, All Saints Day (Tutti i Santi) and All Souls Day (Il Giorno dei Morti) are still important dates on the calendar for Catholics and Italians alike. Great article, Ian...Thanks for sharing this! Halloween more than just an American thing was a festival to celebrate pagan spirits by celts. A practice along with bonfires and dressing up that still continues.